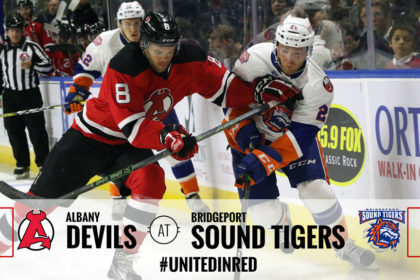 BRIDGEPORT, CT — Luck was not on the Albany Devils side during their 4-2 loss against the Bridgeport Sound Tigers Wednesday morning at Webster Bank Arena. 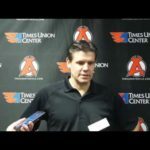 Two fortuitous bounces helped the Sound Tigers to victory during the rare 11 am game. 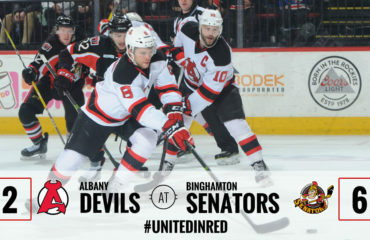 In a 2-1 contest late in the second period, Seth Helgeson’s attempted D-to-D pass through the defensive end hit the officials’ skate and Carter Verhaeghe was alone in front to capitalize. 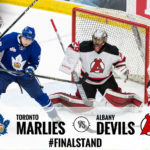 Then early in the third, Reece Scarlett’s clearing attempt from behind Albany’s net hit Bridgeport’s Travis St. Danis. The puck popped over the net and landed at the unsuspecting Scott Wedgewood’s feet. Ross Johnson was there for the easy tap in. On top of the Devils’ bad luck, John Quenneville hit two posts during power-play chances. 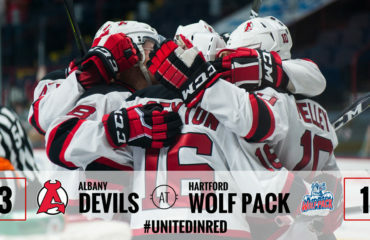 Albany moves to 6-3-0-0, while the Bridgeport improves to 5-3-0-0. 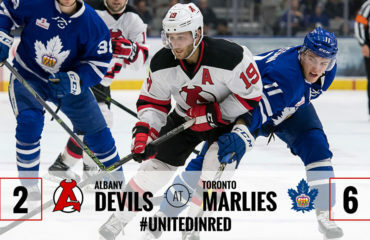 The Devils began with two goals less than three minutes into the contest. Jan Mandat found Blake Coleman flying through the slot. After receiving the puck, he sent a quick shot and followed up on the rebound at 1:54 for his second goal of the season. Less than a minute later, Rod Pelley forced and offensive-zone turnover and the puck found its way to Ben Thomson near the left face-off circle. He snapped a shot behind Bridgeport’s Christopher Gibson at 2:51. 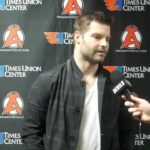 After being outshot 12-3 in the first period, the Sound Tigers flipped the script. The home team scored twice to during the second and owned a 14-3 shot advantage. 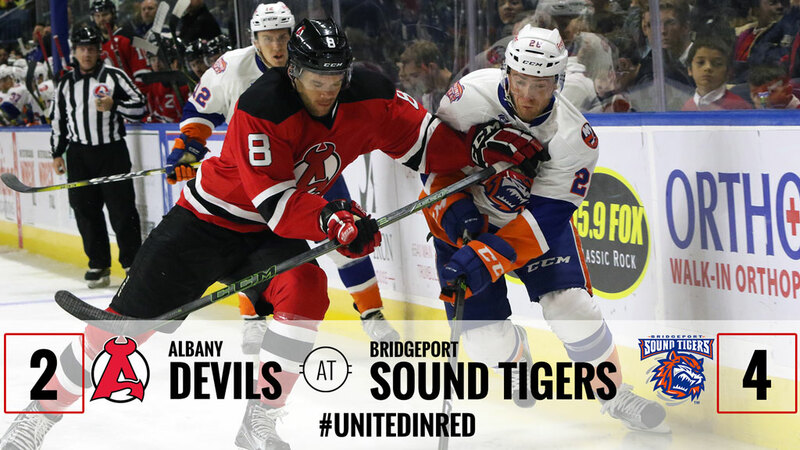 Michael Dal Colle found the back of the net at 5:06 to start Bridgeport’s scoring. 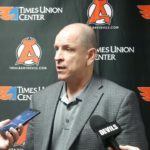 The Sound Tigers’ lucky bounces followed and Bracken Kearns concluded the game’s scoring with an empty-net goal in the closing minute. In goal, Wedgewood finished with 23 saves, while Gibson made 24 saves to improve to 5-0-0. 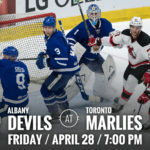 The Devils return to action Saturday on the road against the Hershey Bears at 7 pm.